Cast: John Leguizamo, Denis Leary, Ray Romano, Queen Latifah, Seann William Scott, Josh Peck, Will Arnett, Jay Leno. Story: The ice caps are melting. 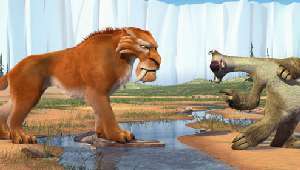 Ice Age: The Meltdown is every bit as good as the original - but no better. All the ingredients that made Ice Age so much fun are still there, but there's not enough novelty to compete with the big boys. The first Ice Age was somewhat unfairly overlooked at the time of its release, coming in the wake of Toy Story and Shrek as the animation boom began to rumble. The acorn-seeking Scrat must be one of the best cartoon characters ever created - in the sequel the writers have wisely decided to continue limiting him to his little self-contained vignettes and have increased the number of them, so the little fella appears regularly throughout the movie, providing welcome comic relief from the main story, which is, in all honesty, a bit of a drag. John Leguizamo's Sid the sloth is still the most entertaining of the lead bunch, with Denis Leary's sneering Diego the sabre-toothed tiger close behind. Ray Romano, who we now know better from "Everybody Loves Raymond" lumbers along as Manny the mammoth and this time we're joined by Queen Latifah as his love interest and a couple of possums, one of whom is none other than Stiffler (Seann William Scott) - though I have to confess I had no idea it was him until the credits rolled. The animation is up to the standard you would expect - but from memory it seems no better than the four year old original. Maybe if I watched it again now I would see the difference, but some of the water effects looked bizarrely like they do in old movies - that is, as if the actual water they filmed is 1/1000th the size it's supposed to be. Still, these movies are not about realism, they're about characterisation, and the Scrat has that in droves. 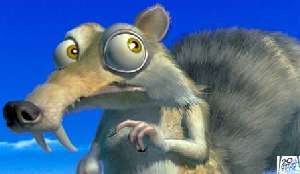 Without him, Ice Age: The Meltdown would be half the movie it is, as he provides around half of the laughs even though he occupies less than 10% of the screen time. There are other chuckles to be had, but they're all aimed at the kids with little concession to the adults who paid for the tickets and are pretending not to enjoy it. They'll still be laughing, but they don't get their own private chuckles like they do in many other kids' movies. Ice Age: The Meltdown is a thoroughly engaging sequel that should keep everyone amused. The kids will love it, the parents will merely like it, no-one is going to be disappointed. It could have been better with a sharper lead storyline, but it could have been a lot, lot worse too. Thank the Scrat for that. To enjoy this film you should be: breathing. Ice Age 2 was released in the UK on 7th April.